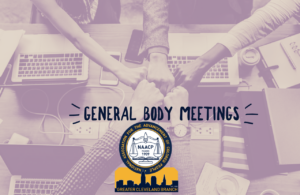 The General Body of the NAACP Cleveland Branch will meet on the 1st Tuesday of every month. In the event that the 1st Tuesday falls on a holiday or election day as is usually the case in November, the meeting will be held on the 2nd Tuesday of the month. Meetings begin at 7 pm.